Spring time is here and bloom time will be soon . Flowers are already budding outside my house. And this new release at DS4J this weekend has some lovely images so apt for this season. This 3d flower set is so fun to play with. The border and vase are from silhouette online. The main background is using MS ornate square punch. I added pearls and diamond stickles to the flower and vase. I have stamped the inside yet. What a fun and beautiful design. I love your flowers and flower pot. Thanks for joining us at Avadares for our final challenge. Cute!!! I love the flowers!! A very pretty card. Thank you for joining us at AGOAC. beautiful vase with flowers Pam, gorgeous card. Oh this is a gorgeous card! I love the vase and flowers, just beautiful! 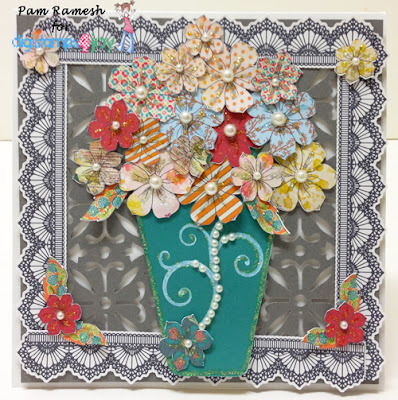 Beautiful card, I love the background you made with the punched shapes. Thanks for joining us at Forever Friends this month. Stunning!! :) Beautiful!! Thank you so much for playing with us this week at QKR Stampede! We can't wait to see what you'll create next time! !